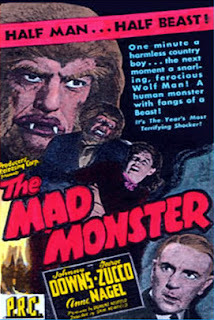 It was inevitable that the success of Universal’s new horror franchise The Wolf Man (1941) would spawn imitators. 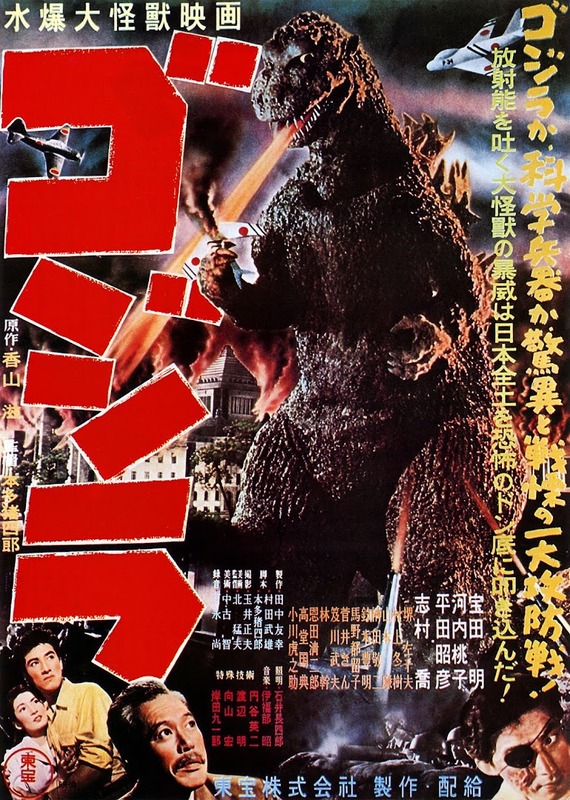 The most blatant rip-off was brought out by Poverty Row studio PRC a year later, sneakily copying the monster’s appearance (albeit lower in budget) and even that of the lead actor to leave no doubt as to its inspiration. 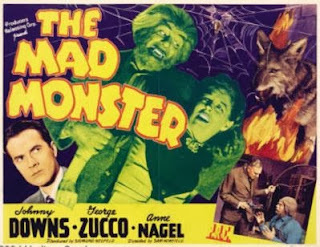 The Mad Monster is by no means the worst film ever made but the evident slaphappy construction and dialogue we shall see is understandable when we learn it is the work of director Sam Newfield, reputedly the world’s most prolific director of talking motion pictures. Estimates range in the 250-300 region (IMDb lists 276). His output makes William ‘one-take’ Beaudine look like Michael Cimino by comparison. Born Samuel Neufeld, he was the brother of Sigmund Neufeld, a creditor of PRC who ended up rescuing the company and heading up their picture division. 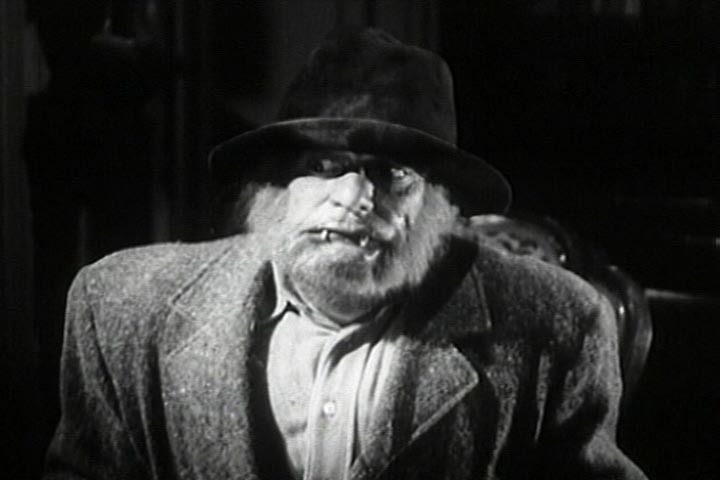 Sigmund created a roster of fast-paced simple fare, (heavily relying on westerns) at a very low cost and stacking the deck with previously unknown talent and, if he could get them, name actors like Lugosi and Lionel Atwill whose private lives were scandalous enough to make them willing to slum it for his studio. Sam Newfield shat out so many feature films for PRC that he had to use the pseudonyms of Peter Stewart and Sherman Scott so audiences wouldn’t realise he was helming so many of their releases. His staggering work-rate makes sense when one considers he was paid just $500 per film – it was the only way to make a living. For this horror vehicle, the studio was able to use the elegant George Zucco who was taking every genre part he was offered and was happy enough to do this in between his sequels in The Mummy series. He is Dr Lorenzo Cameron, a scientist who is as howlingly insane as the wolf he keeps caged up in his laboratory. He is experimenting with a serum derived from its blood which he injects into the body of his hulking, slow-witted handyman Pedro. This introduces us to Glenn Strange whom horror fans will know went on to inhabit Frankenstein’s Monster in three later sequels for Universal. He progressed to working with Lon Chaney in House of Frankenstein (1944) and House of Dracula (1945), which almost seems fated as his role here is to be an echo of two of Chaney’s characters in one. He resembles Chaney facially, is dressed in dungarees and imitates the same child-like, low intelligence speech pattern as Lenny, Chaney’s break-out part in Of Mice and Men (1939). Chaney would later kid Strange about the take-off, the latter claiming never to have seen the stage or film version. To compound the recognition value, Zucco’s experiment transforms him by dissolve photography into a crude version of the Wolf Man – the bare-faced, fuzz-faced gall of it. PRC did not have the benefit of Jack Pierce’s talent in the make-up department. Artist Harry Ross does his best to suggest the vulpine with a thick wig and fangs. Zucco acquits himself to playing Cameron with his customary intense focus and controlled severity. To be fair to Newfield, he does support the actor in a slightly more interesting version of the mad doctor’s usual messianic rave about his misunderstood genius. Instead of the ham soliloquy or gloating to a victim, Cameron imagines lecturing a ghostly collection of his former colleagues who refused to accept his ideas and dared to fire him from his faculty. “He’s a wolf – snarling, ferocious. Lusting for the kill!” he crows jubilantly about his human guinea-pig, the first of a weaponised werewolf army he proposes for warfare. If his real ex-associates heard this, they’d be reassured as to their original decision. He vows to kill them one by one – no prizes for guessing how. Fred Myton, who wrote many B-picture scripts for PRC, seems determined to keep reminding us that talents often rise as high as they are meant to. His perplexing dialogue masterfully contradicts and confuses sense. For example, Cameron visits his old associate Dr Blaine (Robert Strange) who predictably will not condone his work: “Mingling the blood of man and beast is downright sacrilege”- yet when Cameron reflects back his rejection, Blaine replies “Not at all. I will co-operate in any way possible”. Strange was known for playing eminently corruptible types; here the screenplay certainly offers him flexible principles. He will soon regret his help though when he agrees to inject Pedro while Cameron is out. The now-hirsute handyman runs amok and kills him as well. The only character who seems to have a grasp of the monstrosity at large is the craggy, pipe-smoking old grandmother of the grieving family, memorably etched by English actress Sarah Padden. She knows the culprit is a cursed werewolf, but who would believe her? “You can’t kill him no way - except by a silver bullet!”. Meanwhile, one more of the gullibles on the menu is another nemesis of Cameron’s, Dr Fitzgerald (Gordon De Main) who is smart enough not to allow himself to be a test subject for injection by the man he helped to fire – “I’ve discovered the source of life!” - yet dumb enough to give his giant labourer a lift on an errand. He comes to a fanged end from his suddenly-transformed passenger. Unlike the writing, Fred Preble’s swamp set has some depth and is a more fitting place for atmospheric fog than the text. When murky Cameron matches wits with the sunny newshound Tom, he resents the young man’s insinuations of a motive for Fitzgerald’s murder: “Your newspaper training seems to have bred a suspicious nature”. Does he mean that trusting everything at face value makes better journalism? Such fiendish unreasonability is fortunately shared though by the forces of good. The family of the murdered child plus Tom pursue Pedro as a vigilante mob through the undergrowth back to Cameron’s house. It is here that the admirably Spartan lay-out of his lab becomes glaringly noticeable. There is literally no apparatus in the foreground – just the bed where poor Pedro was strapped during his werewolf birthing pains. Any equipment of Cameron’s appears to be always stacked on the shelves at the back. Similar tidiness applies itself to the climax during which a freak burst of lightning sets the house on fire and the hairy freak does a retributory laying-on of hands to his cruel master in the shadows till flames consume them both.